Not many bands deserve to be labelled "legends", but VOIVOD are definitely one of these bands. The Canadian band from Montreal never had their commercial breakthrough but influenced legions of metal bands with their original sound, a sound that no band was ever able to copy - Unique and special. VOIVOD are one of the bands which both fans and musicians have great respect for. Now they’re back with the fourteenth album, "Katorz" ("Quatorze" means fourteen in French). The album was finished under tragical circumstances: Piggy, legendary guitar player and founding, member died of colon cancer in 2005 during the recording process, but it was his wish, that "Katorz" would see the light of day. His guitar parts were already recorded on his laptop. He gave Drummer Away some advice on how to find and use them. So the album was mainly put together around Piggy’s guitar parts. His music lives on! "Katorz" is a monster of an album. 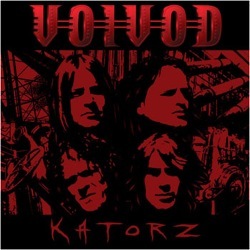 It takes the Rock n Roll roughness of the last album "Voivod" and combines it with the outer space atmosphere of the classic "The Outer Limits" to a real sensual frenzy, but you will also find all the other phases of VOIVOD in the sound on “Katorz” Produced by Glen Robinson (who also worked with the band on "Nothingface"), the sound is maybe the best, that VOIVOD ever had on a disc! Songs like "The Getaway", "Silly Clones" or the up-tempo smasher "The X-Stream" are likely to be classics and will make every VOIVOD fan happy. Snake sings like a young god and Piggy’s enormous riffing is as striking as ever. Add the pounding bass of ex-METALLICA bass player Jason "Jasonic" Newsted, a long time VOIVOD-Fan, who joined the band in 2001, and the tight drum patterns of Away – On "Katorz", VOIVOD are stronger then ever! Don’t miss this incredible album – listen to it at maximum volume and enjoy your ride to outer space!